I’ve just wrapped up several days at Cleveland Clinic’s sixth annual Patient Experience Conference, where over 2,100 participants gathered in the world’s largest independent event focused on improving patient experience. Among the hundreds of stories held up as being examples for progress, was thrilled to hear others describe the remarkable work of ISITE clients how are helping to lead change. Patients need reliable information for selecting care and caregivers. 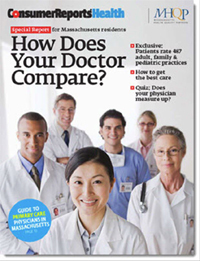 Dr. Merlino shared a recent Consumer Reports issue for Massachusetts that showed quality scores for hospitals and physician practices using the same kinds of rating systems consumers would use for other considered purchases. “Imagine if you could go to Consumer Reports to compare provider outcomes,” Merlino said, showing the publication that was made in partnership with my client Massachusetts Health Quality Partners. There was excitement in the room as he suggested that opening up data will bring a new accountability and reality to how we all think about healthcare. I’m always glad to cross paths with Jeffrey Rohrs, who is VP of Marketing Insights for ExactTarget. His new book, Audience, focuses on the need to treat building relationships (or audiences) as a primary business activity. He featured the remarkable work done by ISITE client New England Biolabs to serve their audience of life science researchers. They’ve developed a series of applications which customers use through their award winning website, on mobile devices, and even on digitally managed refrigerators that run inside of labs. Together, these systems speed the work of researchers in the field to have fast access to DNA and enzymes needed for their work. Along the way, New England Biolabs gets a better view of how its materials are used, which lets them tailor their offerings to build relationships their customers. As Dr. Merlino and others have noted throughout the conference, “patients don’t just need treatment, they also need care.” Whether it’s measured in Net Promoter Score or HCAHPS, what patients say about their care becomes the brand of the caregiver. Everyone in attendance is aware that this year, patient satisfaction will be tied to the reimbursement rate paid by the Centers for Medicare & Medicaid Services. Hospitals can either gain or lose up to 1.25% of their payments based on scores which include patient satisfaction measures. Over the next few years that rate will increase to 2% of payments by 2017. So, patient experience and the preference it brings surely benefits caregivers in less tangible ways, but now it will also be tied to hard dollars challenging every institution to maintain their rate of improvement. Health organizations are investing in new capabilities to listen to and respond to patients. At William Osler Health System in Canada, medical department heads have the benefit of weekly and sometimes daily feedback so they can spot problems faster. What’s impressive is that they’ve done this economically. They started a call center using one full-time call rep augmented by staff who were unable to do their regular duties. Through it, every patient receives up to three calls two days after discharge, both to check on their health and to assess the care given. They’ve reached over 80,000 patients, and surveyed half of them. If they find serious problems, department heads have agreed to call back patients within one day of referral from the call center. Each Friday, departments download results and announce results and rewards for progress. 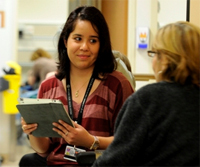 Recognizing that not all patients are admitted, the hospital system issued survey-equipped iPads to ER department volunteers who canvas the waiting area. Each morning the ER’s manager can see what people were talking about over the last day, and get a roll-up of satisfaction scores and check for trouble patterns. So far this process cut ER complaints in half (from 2.13 to 1.04 per 1,000). One innovator, SmartPatient, is going a step further by providing real-time survey questions to patients via their mobile devices. The system integrates with hospital systems, so questions are asked at the right moment in the patient journey for feedback. This lets patients describe what’s going on as it happens without needed to recall it later, and often gives hospital staff the opportunity to act on feedback while it can still benefit the patient. In last week’s Wall St. Journal, the CEO of Athena Health, Jonathan Bush was quoted that “any medical practice that keeps your data from you, doesn’t deserve your business.” The federal Health Insurance Portability and Accountability Act (HIPAA) of 1996 made patient access to records a right, but one that hasn’t been easy, and often one that hasn’t been at all encouraged. A series of grants to Beth Israel Deaconess Medical Center helped create an initiative called OpenNotes, which put primary care physicians notes in their patients’ hands. For many, letting patients see clinical notes is big change. The results were surprising. Ninety percent of patients used OpenNotes to read their doctors notes, and those who did overwhelmingly reported feeling more engaged and in control of their care. When you read the account from the Robert Wood Johnson foundation of a patient who could see their doctor’s understanding through note taking, it’s clear this can be beneficial to digitally engaged patients. So, as Dr. Merlino suggested, no one is able to see all the changes that are ahead. But it’s clear that fundamental progress is possible. And this week we’re hearing from hundreds of organizations who are working to evolve from what built their practices as leadership, to what will drive their growth as the healthcare landscape evolves.